In continuing the “how to” series on this blog, we are turning from glasses to how to carry three plates. 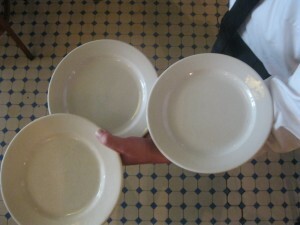 Carrying three plates in one hand is one of the first tricks many servers are required to learn. You can always spot a new server as they carefully walk through the dining room with two wobbling plates in their left hand. This skill when mastered leads a professional server to traverse the dining room with ease while carrying 3, 4, or even 5 plates. Once you understand how to carry three plates, the only limits to the number of plates you can carry is your ability to locate balance points. 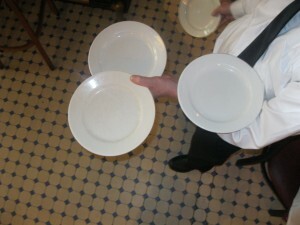 The basic three plate carry is more a matter of technique than balance. The important thing to remember here is that the top of the plate is sacred. 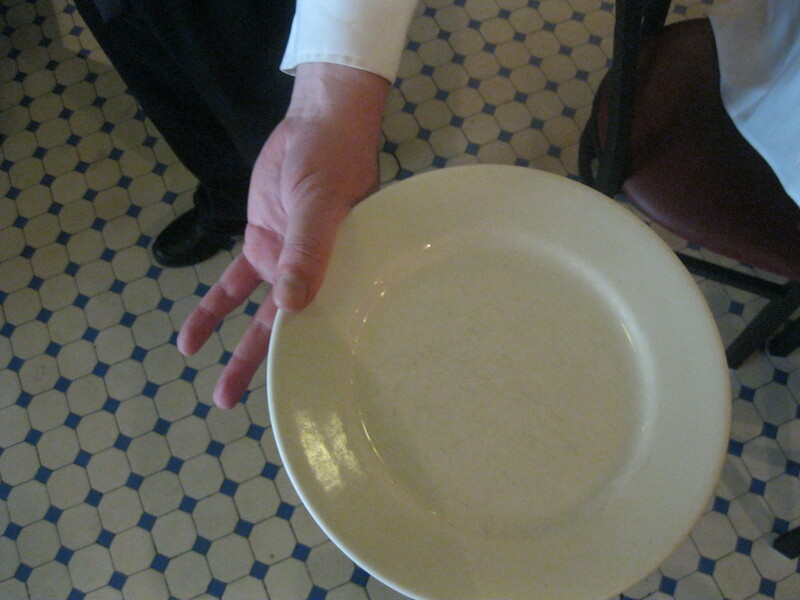 No part of your hand or another plate should ever touch the food on another plate. If when you deliver the plates any of them have food from another plate on the bottom, you have failed to deliver them intact. 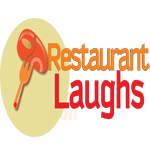 For this reason most restaurants use plates that have large outer lips. Chefs will also usually serve their meals on the center of the plate. By utilizing these two factors, you can successfully carry three plates in one hand. Here is a step by step guide to this practice. 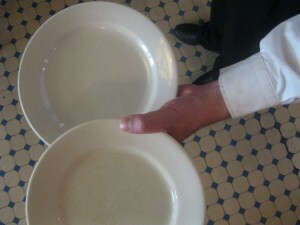 Place the first plate between your thumb and first finger by the edge. Rotate the plate away from your body. Place the next plate under the first. Use your remaining three fingers to support the plate while the top edge of the second plate rests on the bottom of the first. 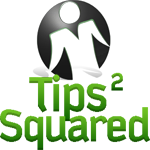 Now that your have learned how to carry three plates, additional plates can be carried from this base by utilizing balance points. Imagine each of the circles above as a plate. The small circles in the pictures represent a spot where that plate is supported. Plate one would likely fall in any direction because it is only balanced on one point. Plate two has a better chance, but would tip to either sire. Plate three is secure because it has three balance points. 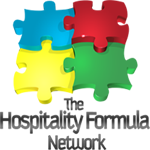 The key concept to remember is that a plate is secure once it has three balance points. With this concept in mind, we can carry additional plates on the base we already have. The third plate is added using my arm as two balance points and the lip of the second plate as an additional balance point. To add a fourth plate, I move the third plate back. This uses my arm as two of the balance points and my body as the third. The fourth plate then uses the third as two balance points and the knuckle of my thumb as the third. 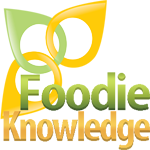 A side view demonstrates that the height added by the stacking will allow greater clearance between the food on one plate and the bottom of the next. 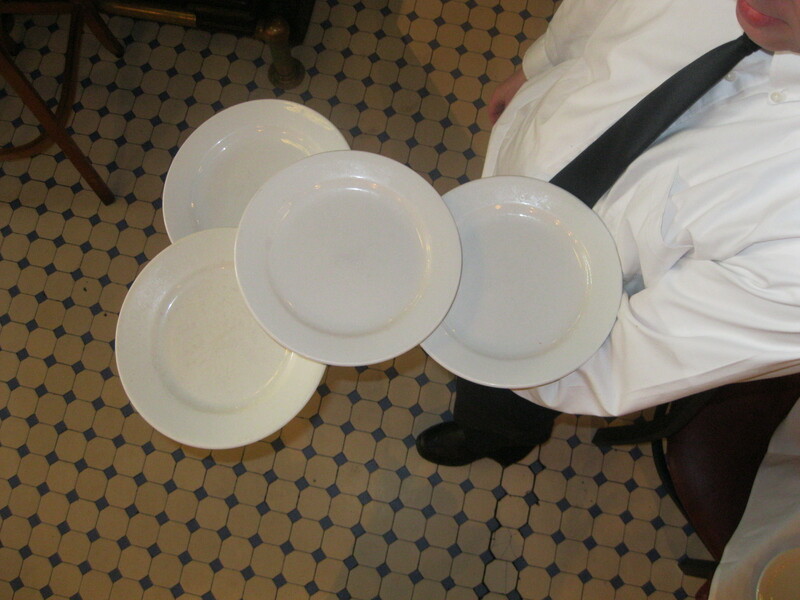 By adding an additional plate in the free hand, you can now carry five plates at once. 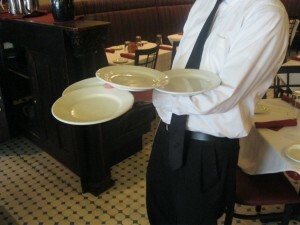 This is a very useful skill in high volume restaurants where the use of trays is discouraged. It is not the ideal way to carry plates, but it is far superior to making three trips to the kitchen because you carry only one plate in each hand. This trick will save you steps and decrease the time your guests spend waiting for their food. 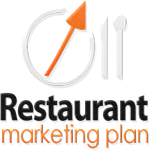 Saving steps can often be the key in high volume restaurants to guest satisfaction on improved income.